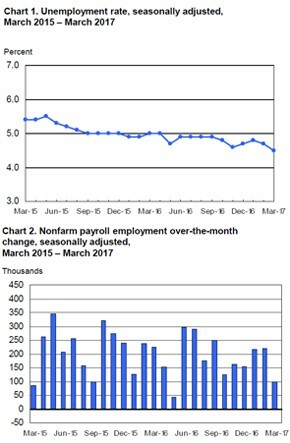 Figures released today by the Bureau of Labor Statistics showed that the U.S. added 98,000 nonfarm payroll positions in March. Economists had forecast that 180,000 jobs would be added during the month, according to The New York Times. The BLS also revised the total number of jobs added in February from 235,000 to 219,000. The unemployment rate inched down 0.2 percentage point from February to settle at 4.5 percent in March. The total number of unemployed persons in the country decreased by 326,000. The labor force participation rate and the number of people employed part-time or marginally attached to the labor force were little changed in March. Average hourly earnings for private nonfarm payroll employees rose by 5 cents in March to reach $26.14. This follows an increase of 7 cents in February. Average hourly earnings have increased 2.7 percent over the year. The New York Times noted that steady hiring over the last several months and a declining unemployment rate have created a tight labor market. The demand for qualified workers has led employers to offer higher salaries to attract new talent and higher raises to retain current employees. By industry, the largest employment growth in March was in professional and business services, which added 56,000 jobs. Services to buildings and dwellings gained 17,000 jobs, while architectural and engineering services added 7,000 positions. Mining had the second-highest job gains during the month, with 11,000 jobs added. Since October 2016, mining employment has risen by 35,000 positions. Financial activities added 9,000 jobs in March. Construction employment was little changed, while retail trade shed 30,000 positions during the month. Employment at general merchandise stores took a particularly hard hit, decreasing by 35,000 in March and 89,000 since October of last year. On March 15, the Federal Reserve voted to raise interest rates by a quarter-point to a range of 0.75 percent to 1 percent, MarketWatch reported. The Fed stated that it is likely to raise interest rates two more times this year.